El Lissitzky intended his Abstract Cabinet (1926/27) to function as a “Demonstrationsraum” (demonstration room): an exhibition space for abstract art that makes visitors aware of their own visual experience, and thus of the conditions of exhibiting itself, through an array of devices fostering both interaction and disorientation. The work of the Russian avantgarde artist has had a fragmented and changeful history. Initially installed in the Provinzialmuseum Hannover in 1927 as a commission by Alexander Dorner, and destroyed only ten years later by the National Socialists, it was reconstructed in 1968 for the Landesmuseum Hannover. This second version was transferred to the Sprengel Museum in 1979, where it has since been permanently exhibited. Each of the Cabinet’s different states has been documented in photographs, so that photography has had a significant impact on the evolution of the space—both in retrospect to historical versions as well as for the current and future reconstructions. The history of this ground-breaking art space is reflected upon in an exceptional exhibition format. With the help of historical and recent photographs, an augmented reality app allows for a virtual visit to the Cabinet, proposing a time travel across the different versions of the installation. The app “demonstrationsraum“ draws on El Lissitzky’s terminology and concept: It transfers his artistic and social vision of uniting art and technology and activating spectators as citizens into a virtual exhibition. In the app, the diverging layers of time represented by digitized photographs taken since 1928 until today overlap precisely with the actual view of the visitors while moving through the space. Upon a closer look, both the differences between the three versions and their similarities become apparent, with the latter lying in the task of shattering the bourgeois monopoly on art, of facilitating participation—a goal that is actualized again by the “demonstrationsraum“ app. The 2015 annual cultural program "inspektionen/teilhabe_n" ("inspections/participation") of the Lower Saxony State Chancellery in Berlin provided the context for the first public presentation of a beta version of the app. In a collateral event to the exhibition, a number of experts from the fields of art history and curatorial studies discussed the contemporary political and epistemological implications of the Abstract Cabinet and its reconstructions. A digital anthology assembles the individual contributions to this conference. On the occasion of the reopening of the spaces dedicated to the permanent collection of the Sprengel Museum Hannover, the app was exhibited in the Abstract Cabinet itself, or rather in the latest reconstruction of the room. The site-specific version of the app comprised an extra function that allowed visitors to the Cabinet to take a selfie in the space, and thus to complement the existing photographic documents on the history of Lissitzky's installation by images depicting the interactive display elements actually being used by spectators. Moreover, the exhibition was a swan song to the 1979 reconstruction of the Cabinet: this version was demolished right after the show closed, to be replaced in early 2017 by a newly built interpretation of the space, one that takes into account more recent art historical research. 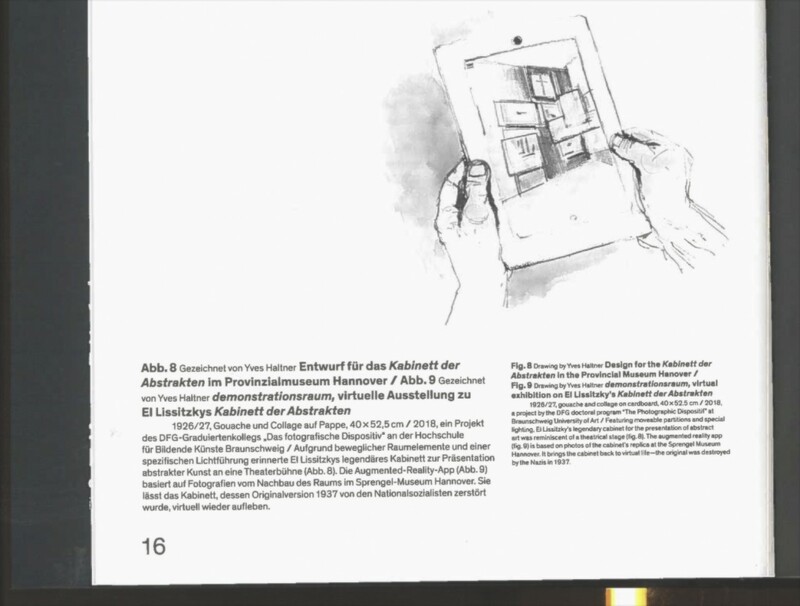 The final version of the 'demonstrationsraum' app has been exhibited in Braunschweig while the 1979 reconstruction of the Cabinet was being demolished in Hannover. It is a monument to this space that, in spite (or because?) of its numerous shortcomings had a significant impact on how the Abstract Cabinet was perceived for decades. This new version of the app now features a selection of the selfies taken inside the 1979 reconstruction by visitors of the Sprengel Museum during previous exhibition of 'demonstrationsraum'. As the show in Braunschweig came to a close, the app was made available as a free download for iOS and Android devices in the respective stores, and the anthology "Politics of Aura", assembling the contributions to the Berlin conference, was publicly launched. The app is currently being shown in an exhibition jointly developed with the Goethe Institut Novosibirsk, in the city that played a decisive, yet often neglected role in the public perception of Lisstzky's life and work. Sophie Lissitzky-Küppers, the artist's widow, was deported to Novosibirsk as an "enemy alien" in 1944, and continued to live there until her death in 1978. From her Siberian exile, she managed to publish a collection of her husband's writings in collaboration with a Dresden-based publishing house, thus crucially influencing the art historical assessment of Lissitzy's estate; however, political circumstances prevented her from benefitting directly from the rise in prices that both her husband’s body of work and parts of her own collection of works by other artists (seized by the nazis) saw on the art market. On the occasion of the exhibition in Novosibirsk, the life of Sophie Lissitzky-Küppers and her impact on the city will be addressed in a series of public events, jointly conceived with local cultural and academic institutions. Additionally, both the app and the accompanying publication have been translated into russian. Yves Haltner (drawing): demonstrationsraum, in: Johan Holten/Kunsthalle Baden-Baden (Eds. ): Ausstellen des Ausstellens. Von der Wunderkammer zur kuratorischen Situation (Catalog to the homonymous exhibition at the Staatlichen Kunsthalle Baden-Baden, 2.3.—17.6.2018), Berlin/Stuttgart: Hatje Cantz 2018, p. 16. Courtesy of the editors, the artist, and the publisher. In a show titled "Exhibiting the Exhibition. From the Cabinet of Curiosities to the Curatorial Situation", the Staatliche Kunsthalle Baden-Baden exhibited historical artifacts and works of art in relation to the history and the contemporary tendencies of museum display practices. Here, the app was exhibited next to Kabinett der Abstrakten (After El Lissitzky), a 2003 work by Goshka Macuga also referencing the Hannover space.